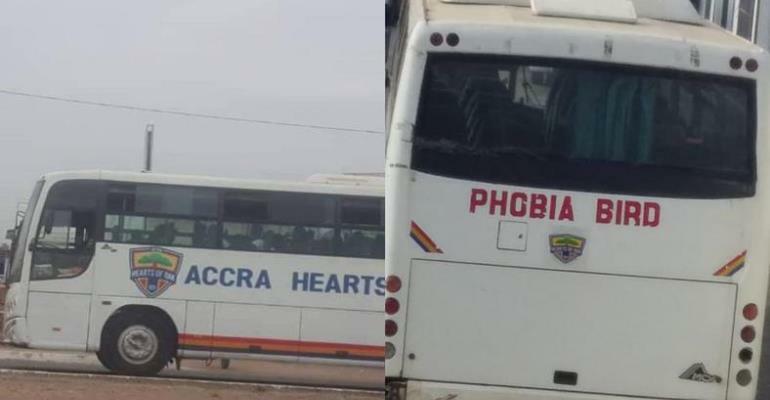 Social media users have expressed their disappointment with the state of Hearts of Oak's team bus. The capital-based club is the oldest club in the country but seems to be lacking focus and proper rebranding. However, after defeating Dreams FC by a lone goal on Sunday in the matchday one of the Normalization Committee Special, the team bus was spotted in its worse state which has generated controversy in the aftermath of the game. The conversation began when Sports Journalist of the year and head of Sports at Atinka Media, Saddick Adams shared the team bus on his facebook page. He appealed to the hierarchy of Hearts of Oak to get a new bus or ground the current one to preserve the safety of its players and other staff. “Accra Hearts of Oak Management and fans, you can attack for all I care but kindly treat this with the urgency it deserves,” he wrote. “Ground this bus until the chairman is ready to change it, or contribute to buy a more befitting one.